There are a lot of winter gloves that could be considered as photography-friendly. How do you choose the best ones, in terms of price-quality ratio? … then Markhof Pro 2.0 gloves might be your best investment as a winter photographer. There. Saying this right off the bat. Markhof Pro 2.0 gloves are unique. Because unlike other products, these winter gloves were created for cold-weather photographers BY photographers. I mean, they KNOW what you want and need. Markhof Pro 2.0 is one of the best winter photography gloves for 2019 that don’t compromise on functionality or style. I wanted to give you background on Vallerret, so you understand why their products work specifically for photographers. Vallerret is a fairly young company, founded in 2014 by Carl van den Boom and Stine Lyng Jørgensen. They decided to design gloves to solve their own problem that they had as snowboarders AND photographers. without gloves you just end up freezing your hands. In just a few short years, Vallerret became recognized for their premium winter gloves for photographers. They wanted to create photography gloves suitable for every day use in the winter. They didn’t want to compromise on functionality and style. … Which leads us to a quick “comparison” between the original Markhof Pro version and the updated 2.0 version. While the original version was pretty popular too, there were some minor complaints. The 2.0 updated version certainly is a great improvement over the 1.0 version and they basically made an already awesome glove even better. Let’s discuss what exactly you might love about Markhof Pro 2.0 model. Honestly the build quality and functionality is awesome. I know some people don’t really care about it, but personally I love the fact that they are stylish. Like I mentioned earlier, the build quality and the level of attention paid to small details is great. These photography gloves use 100% merino wool as a base layer. Basically it allows Vallerret to produce thin and fitted gloves, and still keep you warm. This fabric makes gloves ultra breathable. … which do a great job keeping water out and adding extra protection for your hands. It also does a good job keeping wind out. That is why any adventurous winter photographer should consider this pair of gloves. Remember how I said earlier how original Markhof Pro could’ve been a bit warmer? This time Vallerret added Thinsulate mid layer. Having gloves with high performing insulation means staying warm when shooting out in the cold winter days. As a winter photographer you can’t rely on battery heated/regular winter gloves because they’ll simply interfere fear with your shooting process/camera control. Yet, you need stay warm. The way these gloves work is that you flip your finger caps and this way you’re only exposing the parts that you need to access camera dials and take a photo. You stay warm whenever you shoot. Rubberized non-slip grip ensures a perfect camera grab and change the lenses without any issues. Last thing you want is for your gear to slip out of your hands! You’ll find nice SD card pockets on the back of each hand with a zipper. Pro Tip: You may try adding small hand warmers in those SD card pockets to keep your hands even more warm during cold days. Clearly, it’s a very well thought out design. Markhof Pro 2.0 is slim fit and has unisex sizing. While Vallerret strives to produce the best photography gloves, no product is perfect. What I’m about to mention isn’t necessarily a “disadvantage” but something that you’ll need to keep in mind. While Markhof is windproof and water-resistant, they aren’t fully waterproof. So, this means that if you’re out in the rain, your hands will get wet. These gloves are NOT touchscreen compatible. This might be a deal breaker for some people but that’s basically the trade-off in order to have extra warmth when wearing Markhof Pro. These gloves are suitable for every day use in MID winter. I certainly don’t recommend using this product for harsh temperatures below 15ºC (5ºF). 1) How much do they cost? As of now, it’s around $80. For some, this price tag can be seen as a significant drawback. But these gloves are certainly high quality. Amazon prices are subject to change, so you’ll need to hit the button below to see the most current prices. 2) Does Vallerret company have a good reputation? I mentioned earlier that Vallerret is a pretty young company but they already managed to build a very good reputation among winter photographers. Most Vallerret photography gloves are one of the top rated on the market right now. 3) Which type of person should consider these? 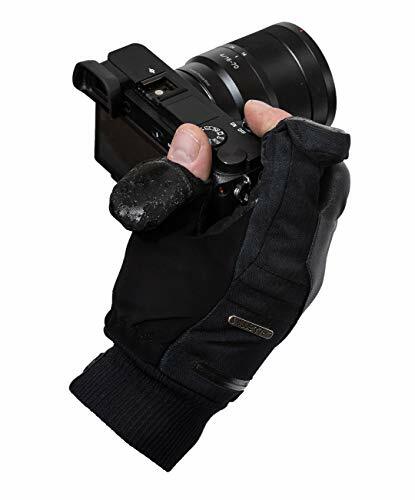 Without a doubt, it’s for adventurous winter/cold-weather photographers, who need to keep their hands toasty and the tactile control to operate camera without any issues. … then these gloves are for you. And Markhof Pro 2.0 DEFINITELY is for you if you love skiing/snowboarding as much as you love photography. 4) How cold of temperature can these gloves survive? These gloves are designed for mid-winter, let’s say -10ºC (14ºF). However, keep in mind that everyone is different and everyone handles cold differently. 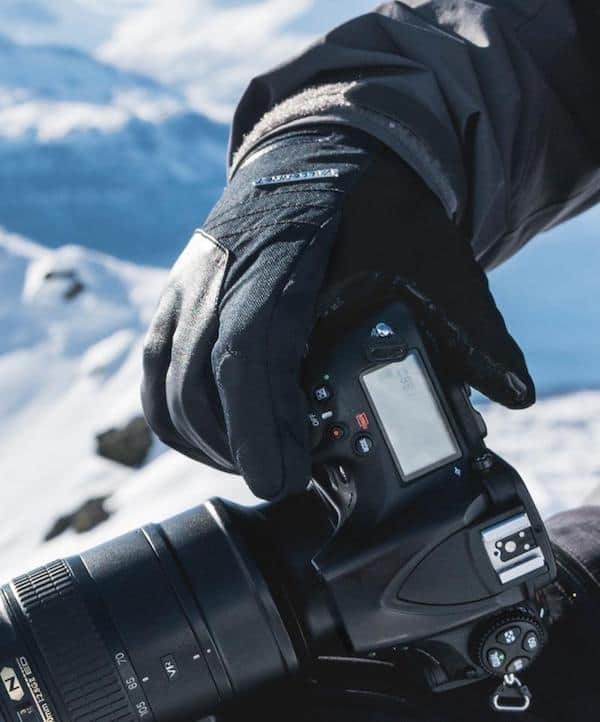 If you feel like you’re one who doesn’t handle cold well, you may consider other options from this list of top rated photography gloves for winter shooting. If you use Markhof Pro, you can use small hand warmers in SD card pockets to stay warmer. 5) What happens if these rip? How durable are they? First of all, these gloves are made of top quality materials which prevent any ripping. Secondly, these gloves seem to be pretty durable. But they were recently released in the market and I will know for sure how durable they are as time goes. And then will update my answer here. 6) Can you hold small cameras with Markhof Pro gloves? 7) Would you recommend buying them online? To be honest, I think that’s the only way you can get them. They are currently available for purchase through Vallerret’s official website and Amazon.com (might be some other Amazon stores too). Even though Markhof Pro model is one of Vallerret’s newest offerings, it is a must-have for cold-weather photography outdoors. For some, paying around $80 for a pair of gloves might be a lot but the construction, functionality and design sure make it worth it, IMHO. have features that make it super easy to operate a camera. 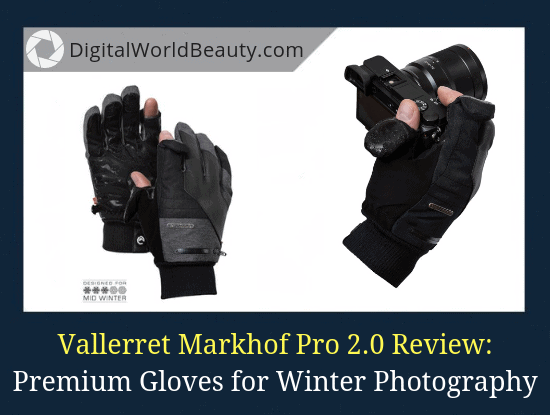 Vallerret Markhof Pro 2.0 is one of the best photography gloves on the market right now. Markhof Pro 2.0 Review 2019: Your Thoughts? How long have you been a winter photography enthusiast? Have you tried any other “special” photography gloves? What do you think of this Markhof Pro 2.0 review? OK…where were these when I was shooting in the cold? These are awesome! I really love the removable finger caps. I’m loving the idea of having SD card pockets too. I don’t shoot with my SLR nearly as much any more. I’ve moved onto aerial drone photography. That said, these might be a perfect fit for flying in cold weather. I need the tactile bare-skin sense of touch for the control dial but also the touch screen. It’s much like my sailing gloves but built for warmth. That’s it, I’m going to have to grab a pair of these Vallerret gloves. Thanks for brining these to my attention! Yeah, the features that these Vallerret gloves offer are awesome. I mean the original version was pretty good too, but Markhof 2.0 version certainly is better. I haven’t used them for aerial photography yet, but I’m fairly certain it’ll be easy for you to operate a drone with this pair of gloves. When you do buy this product, remember that it’s best for MID winter. If it gets too cold you can try adding hand warmers into the SD card pockets. Alternatively, you can choose another product from the same company that are built for deep extreme winters. Glad to be of help and thanks for stopping by! OMG…. I am so glad that I read this review. I’ve been needing to go photograph some black cows one day soon when it is snowing. Yet, I have dreaded going out and doing it because it has been so danged cold. All of my warm gloves are too thick. All of my thin gloves are not warm enough for 15-20 degree F weather. So, did I read this correctly? The gloves are still thin enough that you (I) can operate the camera without lifting the finger flaps, so long as you don’t want to do anything on a touch screen? Regardless, the finger tip flap things are a brilliant idea. I also liked your idea of putting small hand warmers into the SD card pockets. Thank you for this timely review. Black cows? Interesting 🙂 I’m curious, are you in animal or advertising photography business? Before, photographers had to use gloves that were originally meant for fishing because they had cut fingers. Or just regular fingerless options (but again, those wouldn’t do a good job when it’s super cold). I’m glad to see that now we have more options for 2019 at various price points. Anyway, not to sound repetitive but Markhof Pro 2.0 is an excellent choice. I’m glad to see fellow photographers being as excited as I am about these Vallerret photography gloves! I read the reviews on Markhof pro 2.0 photography glove mostly on official website, glad to see an independent in-depth review here. They look decent, I’ll give ’em a try. Thanks. Glad to be of help! I actually plan to write about Heat3 Smart too (and perhaps do a #versus comparison between the two, as well). My favourite 2 choices for outdoor photography in the cold. After reading your 10 best gloves for winter photography list here, I can see why these Markof Pro 2.0 are your first choice. I like the price and style of the Markhof gloves. And I really like the idea of using hand warmers in the SD pockets. I am also considering the FRDM Gear gloves which are about $30 cheaper. The FRDM gloves have touchscreen compatibility to use my iPhone if needed but are suitable for warmer winters. 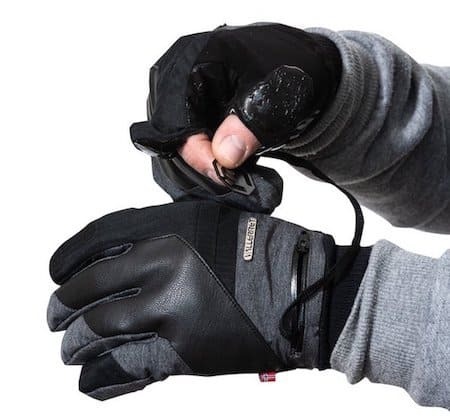 The Markhof gloves do not work on touchscreens but are suitable for colder winters and have the SD pockets that can be used for multiple purposes. Any other major differences between these two gloves? I wouldn’t say there are any MAJOR differences between those two. I’d say Vallerret gloves are super popular among photographers because they are stylish, have good ergonomics and work very well for cold weather photography. 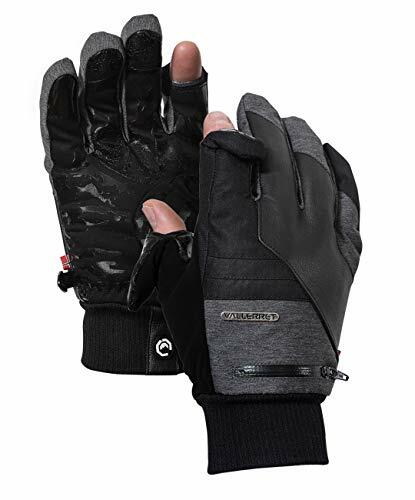 FRDM gloves are awesome for those who are very active in winter time. 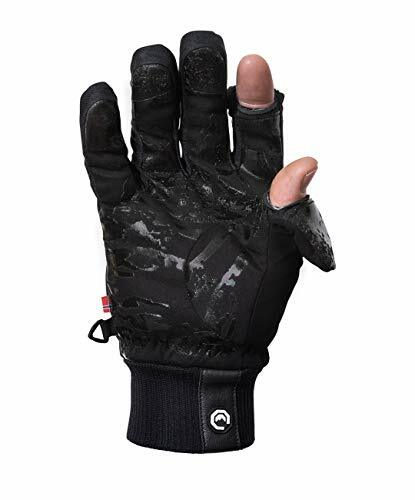 Even though they are the “fishing” gloves they’ll certainly work for your purposes and I think it’s one of those “best value-price” situations. What’s different is that their finger caps are attached to the back with metal buttons (not magnets), and some people like that more. In fact, a lot of my website visitors kept purchasing this particular Palmyth pair after reading the buying guide that you were referring to. Let me know which product you ended up getting. Happy photographing! My son is a photographer and is always trying to find gloves he can use in the winter he loves to take landscape photos and winter here where we are can get fairly cold especially in the mountain areas he like to go. I have watched him cut fingertips off of gloves that cost $40.00 and never blink an eye. He is a big man and has large hands how are the sizes with these gloves do they tend to run true to size or small for the size? Thinking a good birthday gift he will actually use. Yep, I think for most photographers having a good pair of gloves (specifically for photography) is a great gift. Good product choice too. (For what it’s worth, here’s my top 10 list). Vallerret founders designed Markhof Pro 2.0 to be a slim fit so that there’s maximum control of the camera. Given that it’s a snug-fit glove, you might want to get 1 size larger. (Refer to the sizing chart). You might even go two sizes larger because the gloves might not be that big enough for your son. If in case you got the wrong size, reach out to Vallerret customer service. I personally dealt with them before and they are really amazing. Excellent service and their representatives will be happy to work things out with you.